kSex: Brief appearance by a flasher, woman says "I screwed all the judges." 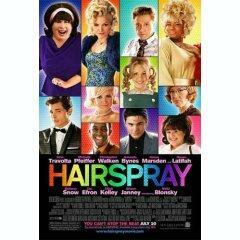 We all eagerly awaited the opening of “Hairspray” the movie – the 2007 version, with John Travolta, Michelle Pfeiffer, et al. The trailers made it look awesome, and our son was very eager to see it. So I went on my own to watch it and see if it would be appropriate for him, and I am so glad that I did, as this is not a movie that he will be seeing until he is a bit older, or we see it at home so that we can either skip some of the scenes, or at least discuss them with him first. For example, in the very opening number – while the main character Tracy is on her way to school in the morning – we encounter a flasher who exposes himself to some ladies on the sidewalk, and a drunk in a bar who passes out and falls off his stool (first thing in the morning, no less)! The fact that the flasher and the drunk are made light of – played for laughs – doesn’t really make it any better for children to see, even though the scenes may be funny for older teens and adults. There is also a scene where Tracy’s mother (played by John Travolta – and he does a fabulous job!) is coaxed out of the house – she hasn’t left the house in years – to see the whole new world outside – and as she is walking down the sidewalk, she glances into the window of a local establishment, and exclaims “It’s so elegant!” – and then the camera pans to the object of her enchantment – several very pregnant women sitting at a bar smoking and drinking up a storm. Now, clearly this is intended as lampooning, and could in fact be a teaching moment for some kids, but not a scene we would have wanted our child to see without knowing about it first. Michelle Pfeiffer’s character is a thoroughly despicable vamp, who will do anything for her daughter to win the local dance competition – just as she did anything herself, years earlier, to win the Miss Baltimore pageant, including, she tells the audience, “I screwed all the judges.” There is also a scene where she attempts to seduce Tracy’s father (Christopher Walken) – it’s over the top, but also quite pointed. The obligatory potty humour actually follows the attempted seduction scene, as Tracy’s father, forced to sleep out of the house, sleeps downstairs in the joke and gag shop he owns – and with nothing else soft to sleep on, fashions a mattress out of dozens of inflated whoopie cushions. The theme which runs throughout the movie – and indeed it does it very well – is racial segregation and the move for integration. While it’s a running theme, it is perhaps most striking and jarring not in the “march” scene, as you might think – but in a scene where there is a dance at the high school. It was very jarring, even as an adult, to see a gym full of teens happily dancing – with a thick rope down the middle of the gym, and all the white kids dancing on one side of the rope, and all the black kids dancing on the other. In fact, for these scenes, this is a great movie to lead to discussions about integration – one of the few I’ve seen where it’s very evident, but not with in-your-face violent scenes – instead showing it as a day-to-day fact of life to be dealt with, and abolished. I disagree that people shouldn’t take their kids to see it if they are under 13. I watched it with my cousin and he’s 10. Not to mention that he understood all the suggestive lines and scenes, and was very amused by them. Besides, the suggestive content isn’t vulgar, it’s just playful and very subtle. Not really innapropriate. That’s just my opinion, though.